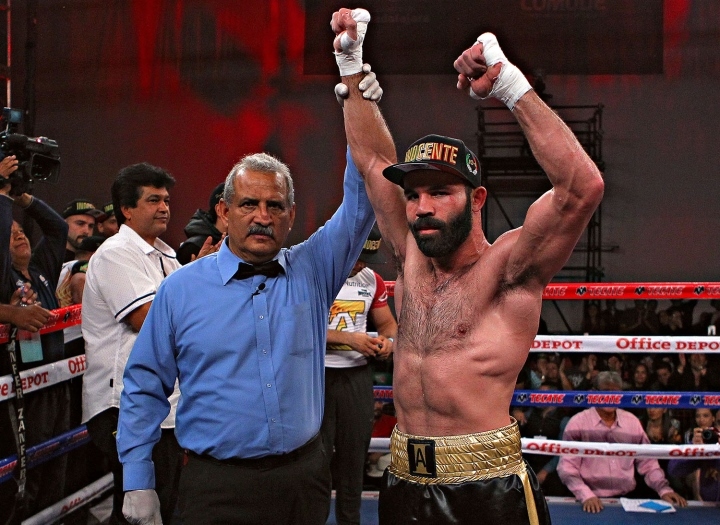 Mexico's Ramon "Inocente" Alvarez took a tight victory by way of points over Argentine opponent Jose Carlos "Puro" Paz in the main event of the card that was staged by Zanfer Promotions at the Sonorous Arena of Hermosillo, Sonora, Mexico. It was the first fight of Saul "Canelo" Alvarez's brother with renowned coach Alfredo Caballero in the corner. After 10 episodes in the super welterweight division, two judges saw Alvarez win by 96-94, while the third had the victory for Paz by 96-94. In the end, the split decision was tipped in favor of Alvarez, who improved his record to 28-7-3 and 16 knockouts. Paz stayed with 23-9-1 and 13 knockouts. Alvarez recovered on the road to victory after being knocked out last November by former world champion Brandon "Bam Bam" Rios in a meeting in Kansas. On this occasion, the Mexican struggled to get the victory and there were some who protested the result. For his part, Paz had his second setback after being knocked out in his previous bout by Anthony Fowler last December on British soil. In the co-feature, Mexican Olympian Joselito Velazquez showed off in four episodes to Angel Guevara in a battle agreed upon by the Mosca weight. Velázquez, who is trained by Freddie Roach and advised by Frank Espinoza, improved his record to 9-0 with eight knockouts, while his foe was left with 15-11-4 and nine by knockout. On the other hand, Sonora's Pedro Campa went to a draw with Sinaloan Abner "Jagger" Lopez in a fight agreed upon for 10 rounds at super lightweight. Lopez gave a good fight and for many had did enough to come away with the victory, but, in the end, the judges saw it as a draw and Campa was left with a record of 30-1-1 and 20 knockouts, and on the other end a record of 27-9-1 and 23 knockouts for Lopez. i watched it last night, it looked as if they were fighting under water, so slow. alvarez got gifted, a family tradition. [QUOTE=ShoulderRoll;19642753]Exactly. Canelo is doing 24/7/365 VADA testing. [/QUOTE] You must be a delusional peasant if you think testing stops PED cheats. [QUOTE=Rigpig;19642384]This is how good Clenelo would be without PEDs. [/QUOTE] [QUOTE=Boxing Hero;19642574]Canelo is on a 24/7 random drug testing. [/QUOTE] Exactly. Canelo is doing 24/7/365 VADA testing. [QUOTE=Rigpig;19642384]This is how good Clenelo would be without PEDs. [/QUOTE] Canelo is on a 24/7 random drug testing.